In a large skillet, combine veggie noodles, coconut oil, sea salt, ginger, and garlic. Sauté covered for about 5-10 minutes or until noodles are cooked but not mushy. Separate with a fork and stir or fold periodically so sea salt, ginger, and garlic are evenly blended. Add broccoli, cauliflower, coconut aminos, and sweetener of choice. Sauté covered for another 2-5 minutes or until vegetables are softened but still crunchy. Sauté longer for softer broccoli and cauliflower. Remove from heat. Let sit for a few minutes to let sauce thicken. Top with green onion and black pepper. If using maple syrup or honey, add in 1/2 tablespoon increments until you reach the desired flavor. You can also use liquid or granulated stevia, however beware the amount used. Stevia is extremely sweet, and a little bit goes a long way. 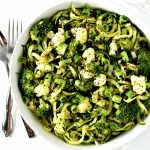 If your zoodles hold more water than you thought, serve using a slotted spoon.